Hundreds of residents gathered near Palace Grounds on Sunday morning to protest the marking of trees for felling/translocation for the proposed stretch of the elevated corridor between Basaveshwara Circle and Mehkri Circle. They held up posters saying 'Mara Hatye Thade Yojane' (save trees campaign) and 'Thou shall not kill trees'. Karnataka Road Development Corporation Ltd (KRDCL) that has been chosen to execute the project had marked 144 trees on Ballari Road a week ago and had not made clear whether the trees would be translocated or felled. 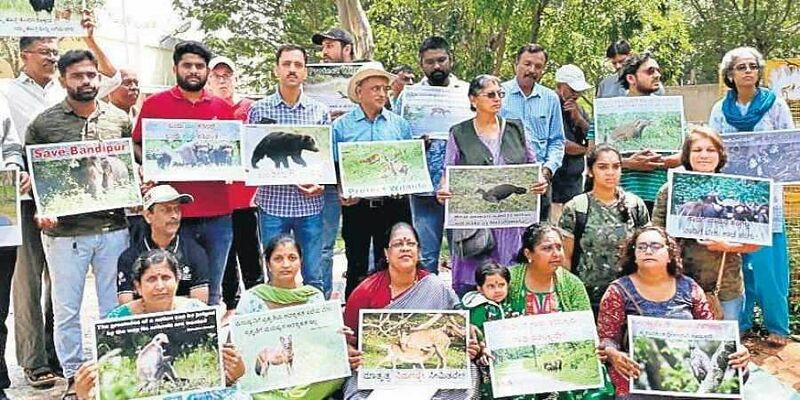 Srinivas Alavilli, co-founder, Citizens for Bengaluru (CfB), which organised the protest, said, "No environment impact assessment has been done and neither have public consultations been held. It is illegal to go ahead with the project without doing either. We want public transport to improve, we want suburban trains, but not such projects." Vijay Nishanth, environmentalist and tree doctor said, "We are not anti-development. We just want sustainable development. Two years back while doing a tree census we found out that 2,024 trees of 71 species will be felled. Now we don't know how many trees exactly will be axed for this project. We are tired of asking for the detailed project report." Tara Krishnaswamy, co-founder, CfB, said that a Detailed Feasibility Report was submitted by the KRDCL to the State Environment Impact Assessment Authority to get environmental clearance but public opinion was not sought. A DFR has to have four alternatives and the rationale behind building in this route. This DFR has none of this. Why aren't Doddajala and Chikkajala stations an option if you're going to KIA? Tara said. The cost of the proposed project is Rs 35,000 crores (Rs. 25,000 crores for construction and Rs. 10,000 crores for land acquisition) and this is more than the health and the education budget. This is mentioned in the DFR, Tara said.